The decision to bring Darren Carrington to Utah was a gamble. As his brief time in SLC comes to an end, that gamble has paid off. (Chris Detrick | The Salt Lake Tribune) Utah Utes wide receiver Darren Carrington II poses for a portrait at the Spence Eccles Field House Thursday, December 14, 2017. With their sights shifting toward the future and an NFL paycheck, a number of NFL draft prospects have decided to forgo their teams’ bowl games. Darren Carrington II isn’t one of them. The senior plans to play Dec. 26 when the Utes take on West Virginia in the Heart of Dallas Bowl. And he hopes to turn some heads doing it. “I hope it’s one for the books, this last one,” Carrington said. No matter what happens in the game, Carrington’s coaches feel confident saying the final chapter of his collegiate career has been a success. 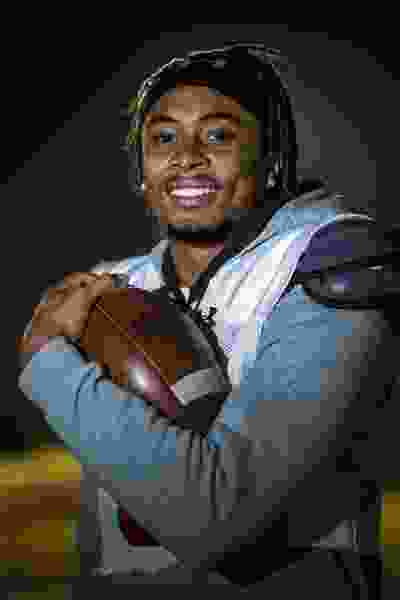 By the time Carrington was kicked off the Oregon football team last summer, he had racked up an impressive reputation on the football field, and a troubled one off it. He had failed a drug test that kept him sidelined for Oregon’s national championship game in 2015. An Oregon fan accused Carrington of assaulting him, and breaking his arm in October 2016. Then he was cited for driving under the influence of an intoxicant after he crashed into a pole in a McDonald’s drive-thru in July. The last offense prompted then-Oregon coach Willie Taggart to dismiss Carrington from the team. “It just seemed like I’m just having something after something after something,” Carrington said. The 6-foot-3 wide receiver considered declaring for the NFL draft. Then he and his father met with the coaching staff at Utah. For Whittingham and the Utes, offering Carrington a roster spot was a business decision and, like all investments, it was speculative. Carrington could run the routes. But could he outrun his past? Six months, 66 catches and 918 yards receiving later, Carrington’s coaches feel confident they were right about this one. “I can’t say enough good things about how he’s conducted himself while he’s been in our program,” Whittingham said. That injury, by the way, doesn’t seem to be bothering Carrington nearly as much these days. But perhaps even more importantly for Carrington, he seems to have taken advantage of the opportunity to rehabilitate his image. Carrington plans to play in the Senior Bowl in January. But the wide receiver said he still is finalizing the rest of his plans for his NFL draft preparations. Some early draft projections have Carrington being picked somewhere between the third and fifth rounds in the April draft. “It was all just like a puzzle and it got put together,” Carrington said.